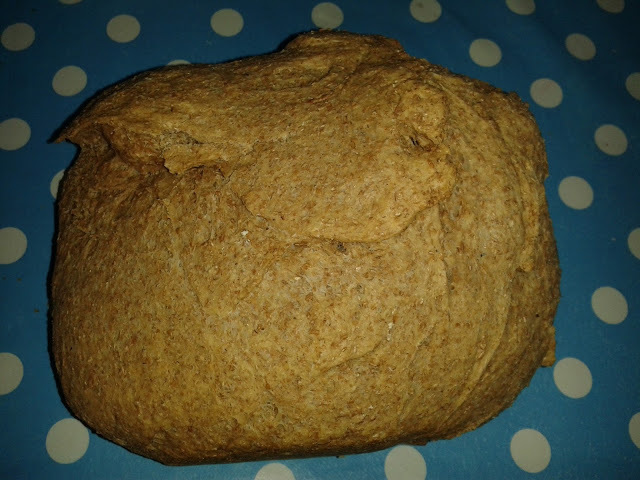 Making bread the zero waste plastic free way! I make bread and pizza dough most weeks around once or twice a week. The great thing about making your own is that it doesn’t come in a plastic bag! Some of the ingredients might though, but I have managed to source most of them plastic free (with the exception of yeast and the plastic in the lid of a glass bottle of olive oil if olive oil is used) – salt in a cardboard box, butter in a paper wrapper, flour in paper bags, eggs on egg carton trays and so on. I have a bread maker but for a while it was broken (we had to get a replacement part, which we now have but it took us ages to get around to doing it). In the meantime I started making my bread by hand and realised that actually as I was home anyway most of the time I didn’t really need the bread maker to make dough. It only takes 5-10 minutes to knead the dough and it is good exercise! Most recipes for making dough without a bread maker include the instruction to put some clingfilm loosely over the dough when it is rising. However there is absolutely no need to use this wasteful product. Even if it says biodegradable on the packet, it is still something that is intended to be used once and then chucked, which is a total waste. Plus biodegradable does not necessarily mean it will break down easily on your home compost heap – it could take months or even years! A bread maker does not use clingfilm when the dough is rising and the reason for this is that bread makers have lids on them. Not everyone has a bread maker though (or wants to use one) and any container with a lid or even something rested over it like a plate which has enough room for the dough to rise will do really! I could have even put my dough in the bread maker to rise without the power turned on. Dough loves being warm and will rise more if it is warm (although you don’t want to let it get too warm). I have found that putting my dough in a large bowl in a freezer bag (making sure there is lots of space between the dough and the top of the freezer bag), then putting the zipped up freezer bag in a warm room (a warm cupboard will also do) works really well. We have a small south facing conservatory (really a clothes drying room) which is perfect for this! I do this because if I try to rise dough in my kitchen it is often too cold in the winter and too breezy in the summer as external doors and windows are open. If you are in a hot country though a freezer bag may not be the best solution! After I have let my dough rise I shape it as I want it, put it on a pizza stone or in a stoneware loaf pan and put it back in the freezer bag to rise again or ‘prove’ as the professionals would say! I love stoneware – it is naturally non-stick once seasoned, so there is no need for baking paper and it is perfect for baking bread on! If you don’t have a freezer bag, don’t worry there are loads of ways to make what is essentially a thermal or heat retention cooker from things you already have – read more here. You can also use a wet towel over your dough, but you will have to wash the towel afterwards. If you use an insulated box or bag or other contraption, then you won’t have any extra washing up other than the bowl the dough is in (which you would have had to wash up anyway). I once tried using a shower cap to cover the dough, but then I realised it wasn’t food safe (read more here) and although I considered buying some food safe elasticated covers I never did. I already have the freezer bags and they provide the extra insulation, so I decided there was no point spending money and wasting resources on something I don’t need! If you are only cooking one loaf of bread, then a bread maker is going to be a more energy efficient way of doing it than using a whole oven, so the trick is if you don’t have a bread maker, to cook it at the same time as using the oven to cook other things. Plus in my house we have solar panels, so I try to time it when the sun is shining! I have read that you can also cook bread in a thermal cooker or slow cooker, but it won’t be quite like bread cooked in an oven and it is not something I have tried. Once the bread is made I store it in a reusable bread bag, but there are a range of options for storing bread. I saw a lovely ceramic bread pot with a lid at a car boot sale on the weekend – it was a bit too big and bulky for my kitchen though! I have to admit though that we do still buy bread in plastic bags as a certain member of my family prefers it to my home cooked version and because he is the only one who eats bread every day at the moment. Home made bread doesn’t stay fresh for long so I would end up making it every day and having bread going to waste every day, which isn’t a great solution. Anyone got any good suggestions for me? What do you do in your household in relation to bread? This entry was tagged baking, bread, cooking, dough, eco, Frugal, Green, heat retention cooker, plastic free, slow cooking, sustainable, thermal cooking, thrifty, zero waste. Bookmark the permalink. ← Party bags – the zero waste, zero cost way! I've always used a damp teatowel to cover my dough. Afterwards it goes in the pile to be washed when the other kitchen towels and tablecloths are done. I sometimes make a bread pudding with bread leftovers. In this heat I've had to put some in the bin :-/ A vegetable crumble with a breadcrumb topping is an option too. Anyway, what I really wanted to say was thank you for recommending freecycle. I joined a few days ago and have just sent a message to someone offering our old camping stove. It's nice to know it's going to a good home, and there's none of the faffing about that comes with selling stuff on eBay. That's great about freecycle – I can't remember what life was like before I knew about it!